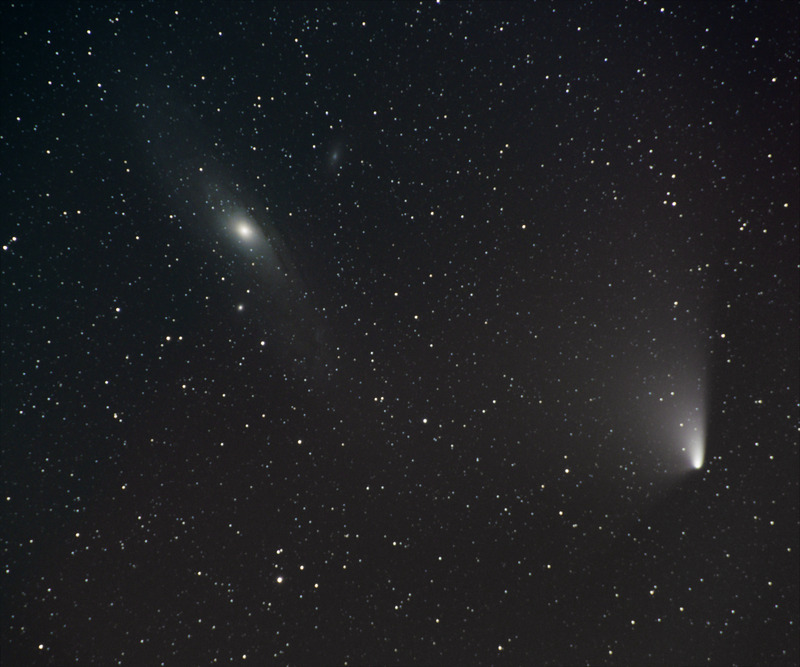 When the Cumbrian skies cleared on 1 April we had the opportunity for several nights of catching PANSTARRS in glorious juxtaposition with the Andromeda Galaxy M31. 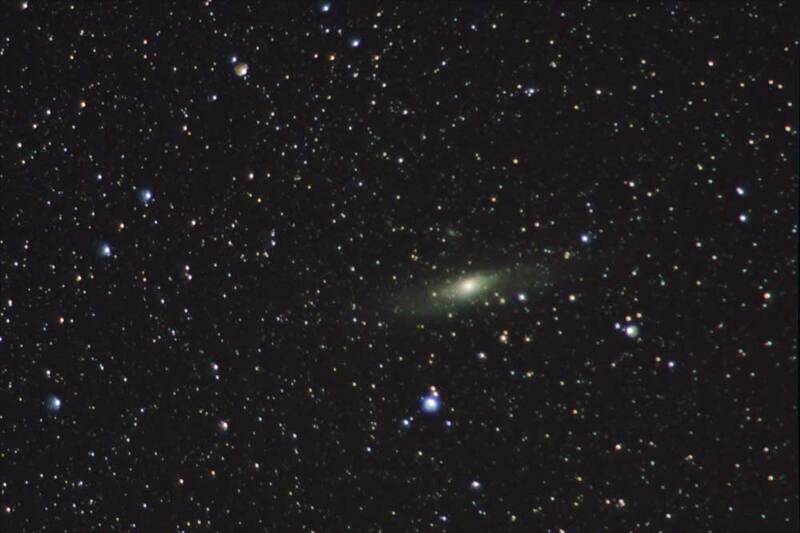 First up, some test frames on 1 April which turned into a nice capture that I’d had in mind for some time. With a standard 50mm lens and some judicious cropping, this letterbox format shows Mirach (one of the guide stars used when finding M31: “from Mirach, hop right one star, then again, then down to the fuzzy blob”) with M33 faintly visible on the left, M31 on the right and PANSTARRS making its way in from the bottom. Quite a windy evening, so I cranked up the ISO to 1600 and took just four good frames at 30 seconds. 200mm f/5.6, ISO 1600, 15 min. 30 x 30 sec. frames stacked in DSS. Quite breezy again, so I kept the exposures down at 30 seconds, but on the 200mm lens. 30 frames stacked for a 15 minute total exposure. 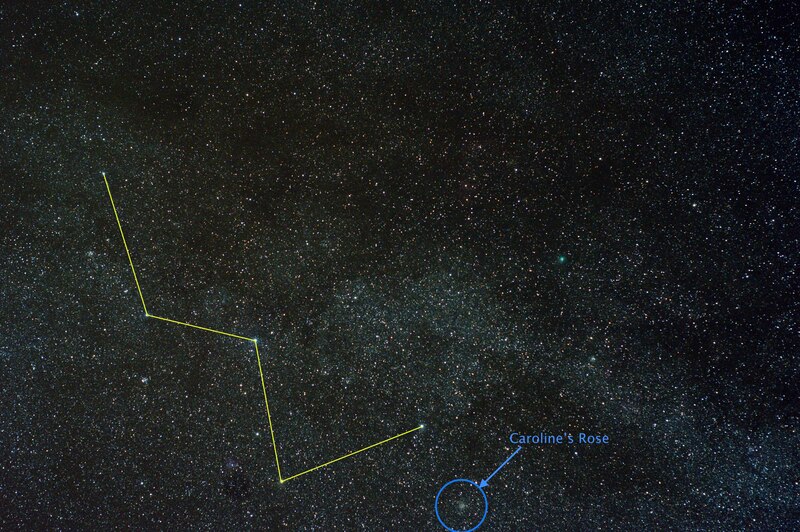 PANSTARRS is only about 7 degrees above the horizon here. That presents a whole new set of problems. At this angle, the line of sight goes through about ten times as much atmosphere as at zenith, multiplying the effect of water vapour on the incoming light. From this location, Helsington Church, the view North-West also passes over the lights of Windermere and Ambleside, giving a street light skyglow to the bottom of the frame. 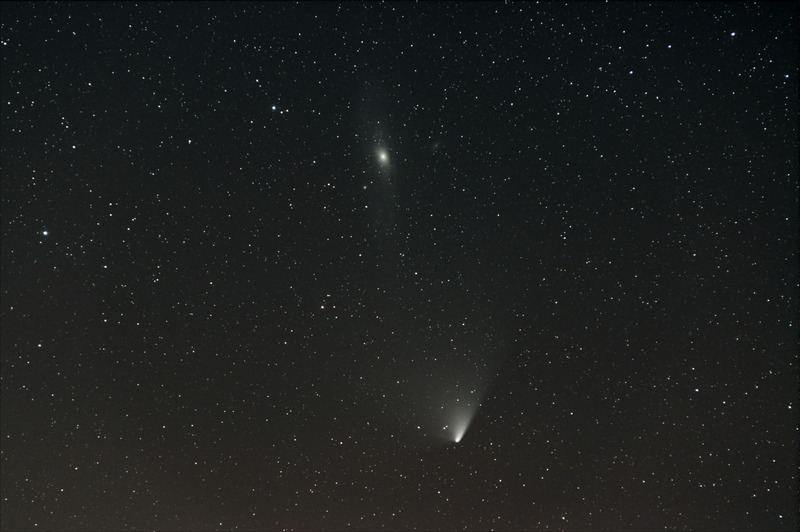 One of the beautiful features of PANSTARRS is its fan tail, glowing by reflected sunlight, so any attempt to process out the skyglow tends to eliminate the tail too. 300mm f/5.6, ISO 400, 40 min. 20 x 120 sec. frames stacked in DSS. 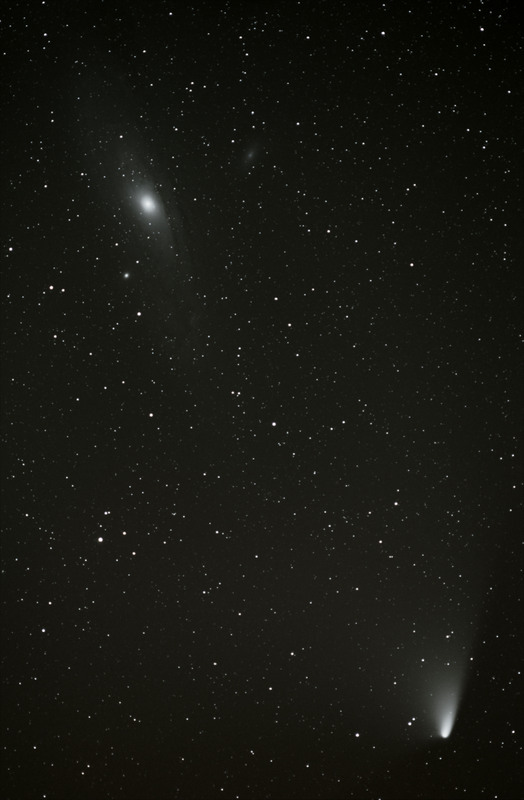 Another shot I had framed in my mind, estimating there would be just enough room in the 300mm frame to put both M31 and PANSTARRS. As the wind had dropped, I could get exposure up to 2 minutes, and grabbed 23 frames of which 20 were acceptable. The birthday fairy brought me a polarscope this year, which dramatically reduces the time taken to polar-align the EQ3-2 equatorial mount. In a couple of minutes I can align more accurately than I used to get from 30 to 40 minutes of drift alignment using the camera. Certainly it is good enough for 5 minute exposures at up to 300mm. I must find time to test the alignment with longer focal length. Anyway, this stack of 12 frames at 5 minutes each has cropped nicely. 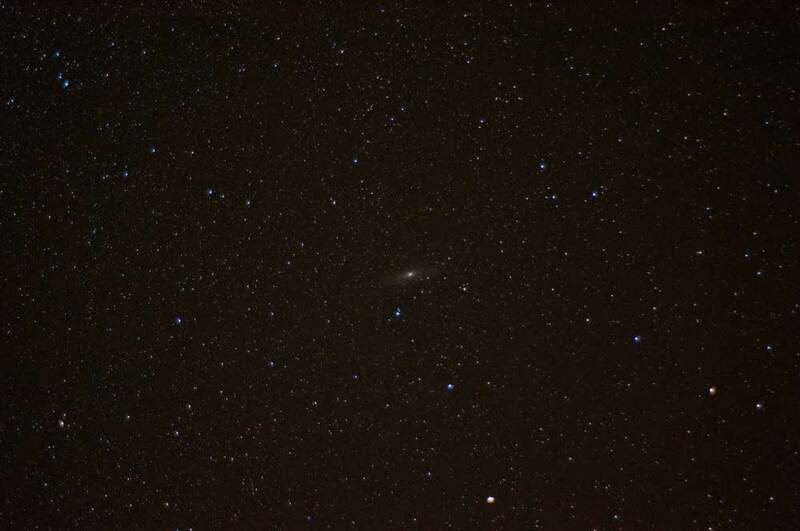 M31 is not as clear as I would have liked (see M31: up to 200mm) but it was too low in the sky for that. There was another very pleasing alignment on 5 April but the Cumbrian clouds had closed in. Chuffed to bits with the eight-frame stack of M31 at 200mm, I couldn’t resist a quick grab at 300mm when the new lens arrived. Fixed focal length Nikon 300mm f/4.5, manual, donkey’s years old, bought second hand on ebay, it has that most precious of attributes – a focus ring that stops at infinity. That means you can focus on the night sky without needing to see what you are photographing. Priceless. 300mm f/4.5, ISO 3200, 180 sec. 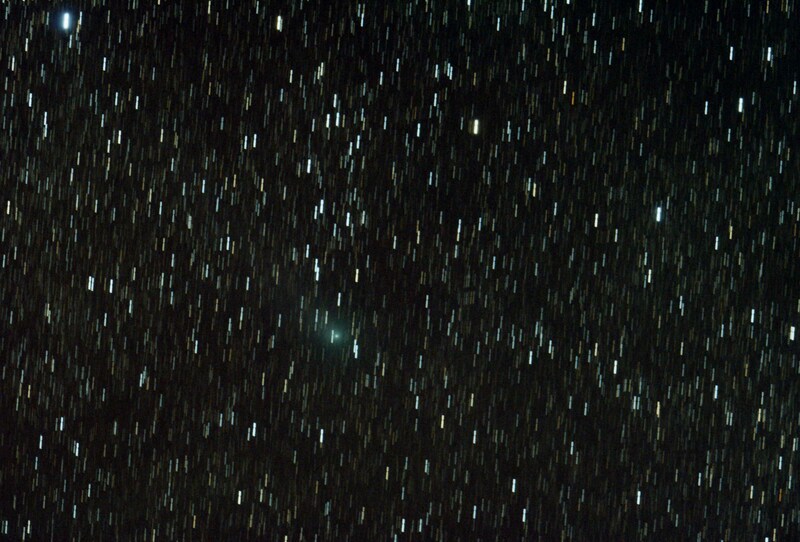 Single frame of 3 minutes at 300mm. 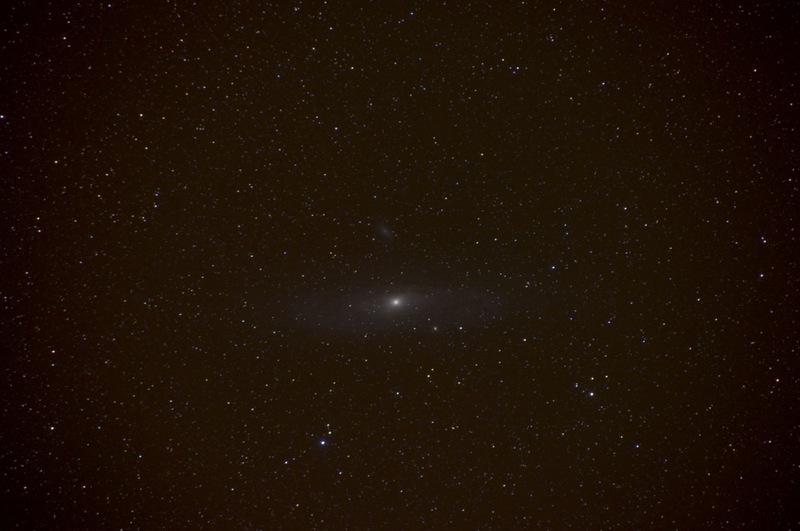 This was at the end of a session experimenting with drift alignment alignment and imaging M42, I quickly turned the camera to M31 and took a single 3-minute frame as I was tidying up. This lens is brilliant. There is almost as much detail in this frame as in the stack of 8 x 5 minutes taken earlier in the month. 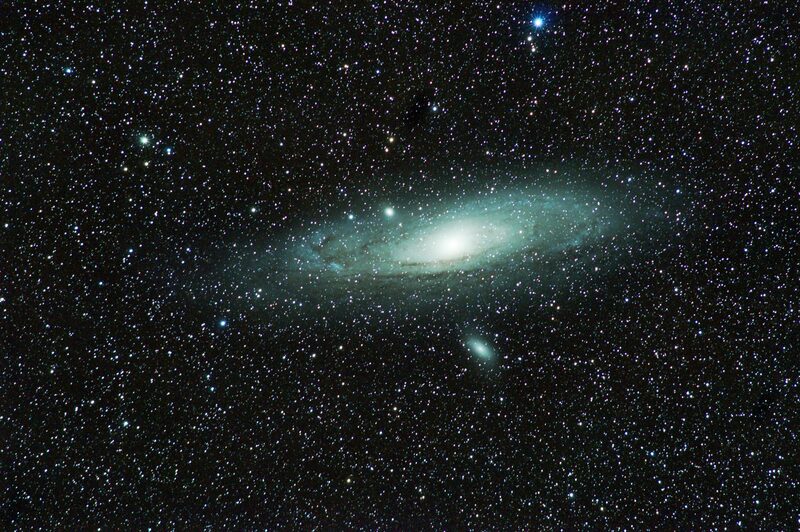 I will do more work on M31 with this lens when I get the opportunity. 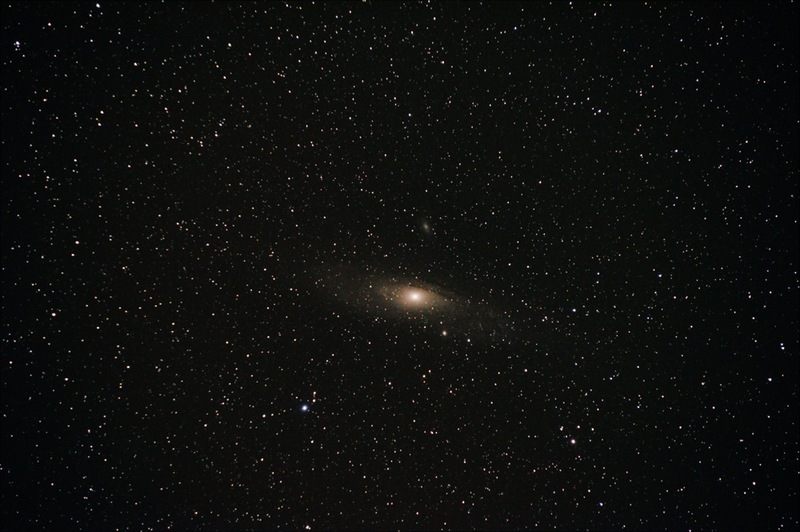 Experience with tackling M31 using the fixed tripod and the 50mm lens made me realise that these objects (let’s not forget M31 is one of the most accessible) need longer exposure and longer focal length lenses. That means using the equatorial mount, and all the issues of polar alignment and motor drives that go with it. The first kit upgrade is therefore a set of motor drives, one for each axis of the EQ3-2 mount. 200mm @ f/6.3, ISO 6400, 330 sec. 11 x 30 sec. frames stacked in DSS. Polar alignment here was by eye (using the hole where the polar scope would go if I had one), followed by several phases of 2-minute drift alignment using the 500mm reflex lens. The whole process takes just over half an hour. 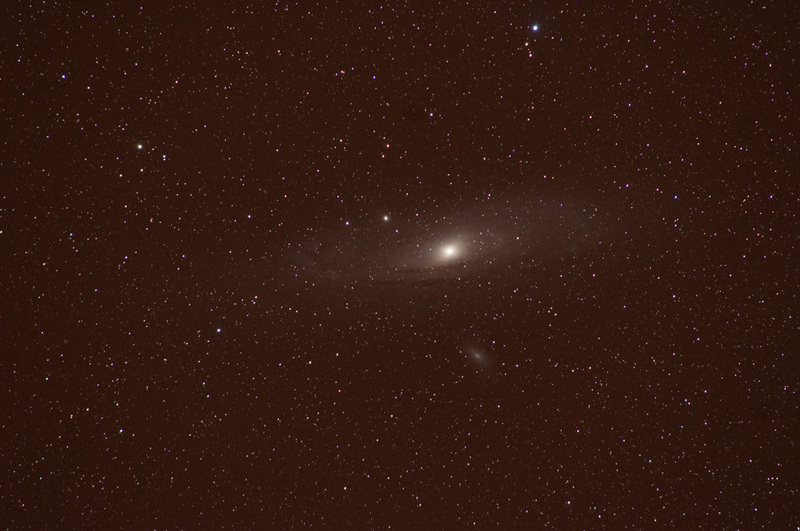 This gives acceptable results with 30 seconds exposure at 200mm. 200mm f/6.3, ISO 200, 5 min. Single frame of 300 sec. Made bold by success with 30 seconds, I push the capabilities of the new motor and my skill at aligning to try five minutes per exposure. 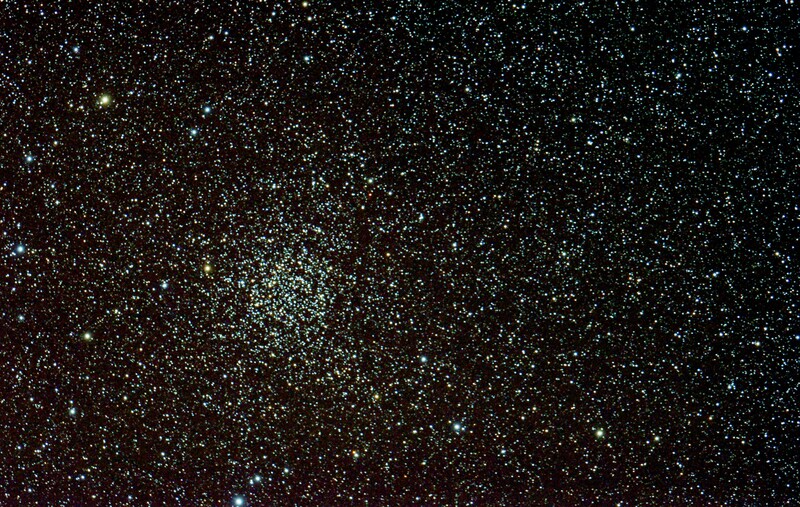 200mm f/6.3, ISO 200, 40 min. 8 x 300 sec. frames stacked in DSS. 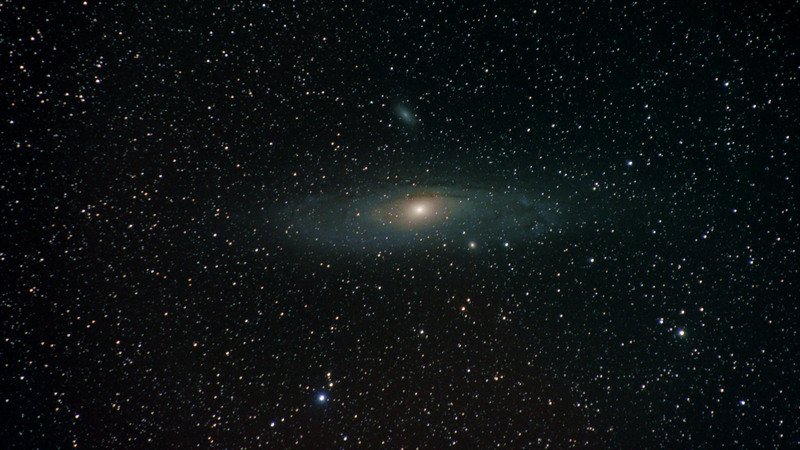 After a few tweaks in Photoshop, this stack of 8 frames of 5 minutes each looks pretty good. The moment of revelation that turned me on to the possibilities of amateur astrophotography occurred on the evening of 5th March 2012, when Jeremy Hunt (not that one) came from Cockermouth Astronomical Society to present some examples of his work in Kendal. All his slides included a note in the corner, giving details of the focal length of the lens used. In the Q&A, I commented that there must be something amiss – if only with my understanding of the process. If he had taken that photo with, say, the 300mm lens as noted, then he must have enlarged or cropped it because I knew the object in the sky simply wasn’t that big. Jeremy’s answer turned my understanding on its head: “It is that big, it just isn’t that bright”. 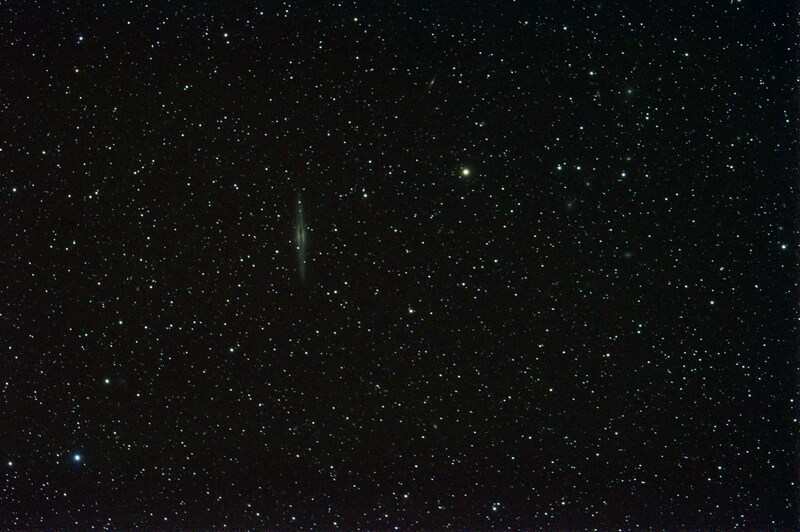 Some of the night sky objects are visually enormous. The reason that we cannot see them is not that they are small, but that they are faint. Next time you look at the full Moon, imagine 12 of them arranged six by two like eggs in a dozen box. That’s the visual size of M31, the “Andromeda” galaxy. 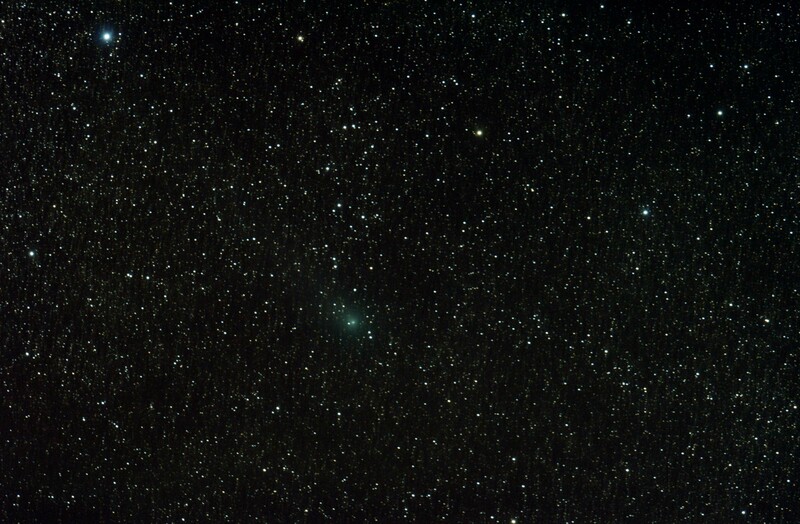 The key to photographing faint objects in the night sky is not magnification, but exposure. You don’t need a long lens, but you do need to hold the shutter open for a long time. Unfortunately for the astrophotographer, the sky moves (the Earth rotates) so long exposures of stars appear as lines rather than dots. 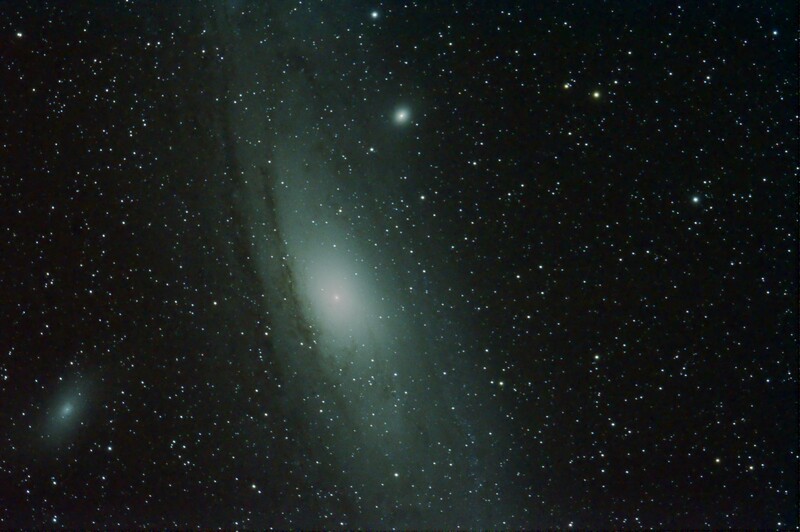 Holding the camera stationary for long exposure against the rotating Earth requires technology which I didn’t have for my first attempt at M31. However, using a 50mm lens and 5-second exposures meant I could get satisfactory results from a fixed tripod. 50mm f/1.8, ISO 3200 5 sec. 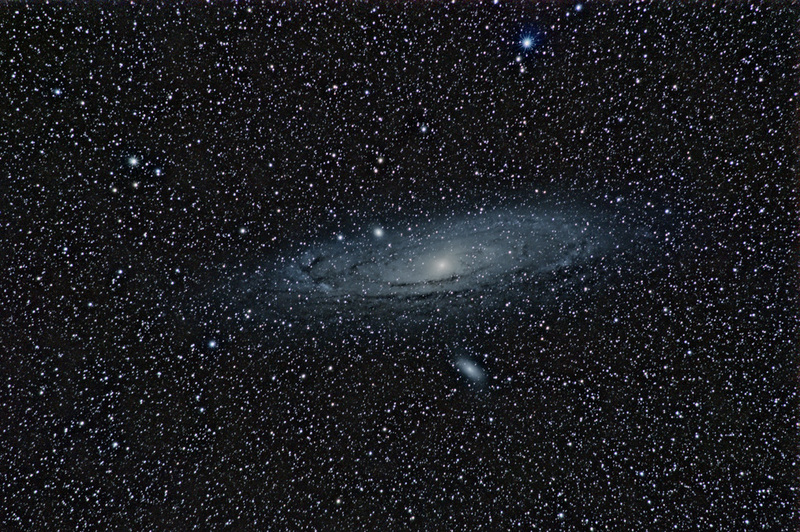 This is a 5-second frame using a standard 50mm manual lens at full aperture. 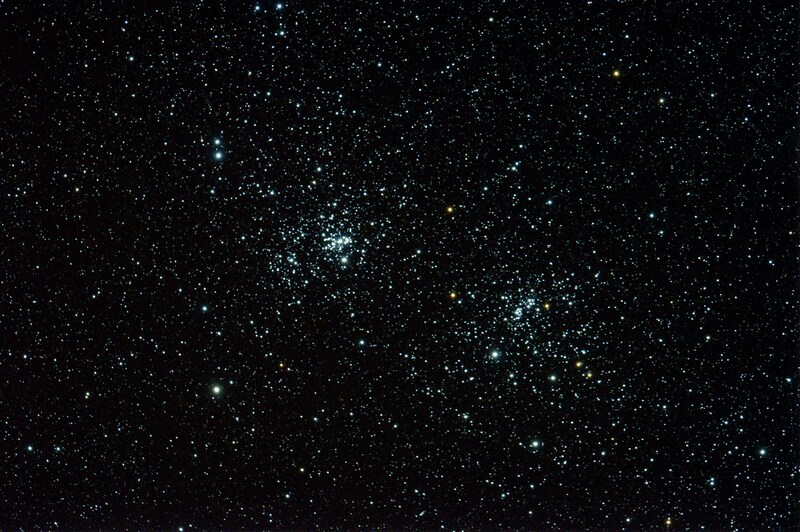 There is nowhere for lens defects to hide in astrophotography, and the distorted shape of the stars towards the edge of the frame is a fine example of coma. Coma is most noticeable at wide apertures, and can be fixed by stopping the lens down. 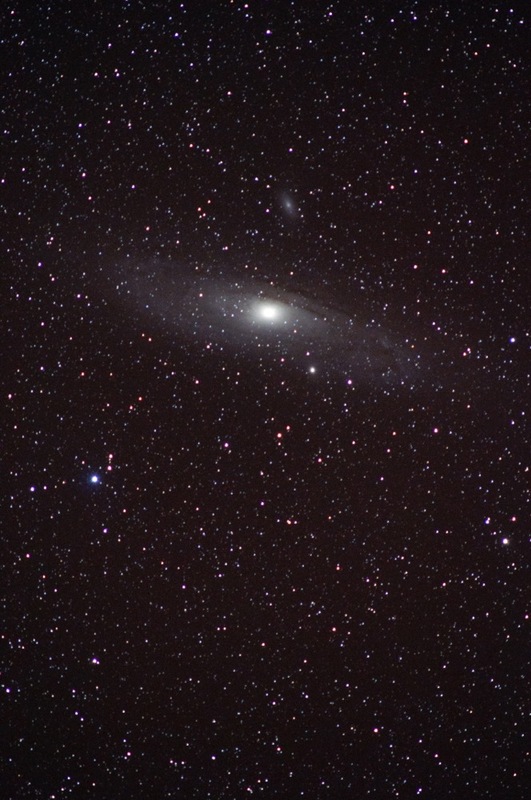 I took 40 frames of 5 seconds and stacked them using the free software “Deep Sky Stacker“. From here, as the song says, the only way is up.